We use SQL PARTITION BY to divide the result set into partitions and perform computation on each subset of partitioned data. 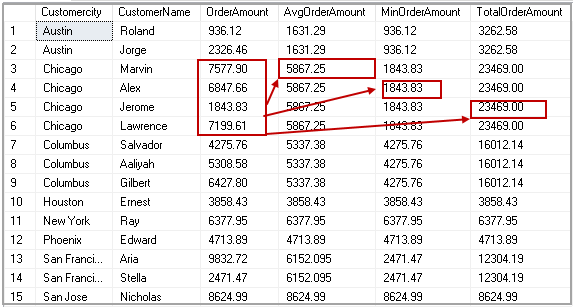 Let us create an Orders table in my sample database SQLShackDemo and insert records to write further queries. I use ApexSQL Generate to insert sample data into this article. Right click on the Orders table and Generate test data. It launches the ApexSQL Generate. I generated a script to insert data into the Orders table. Execute this script to insert 100 records in the Orders table. Once we execute insert statements, we can see the data in the Orders table in the following image. We use SQL GROUP BY clause to group results by specified column and use aggregate functions such as Avg(), Min(), Max() to calculate required values. Execute the following query with GROUP BY clause to calculate these values. In the following screenshot, we can see Average, Minimum and maximum values grouped by CustomerCity. Now, we want to add CustomerName and OrderAmount column as well in the output. Let’s add these columns in the select statement and execute the following code. Once we execute this query, we get an error message. In the SQL GROUP BY clause, we can use a column in the select statement if it is used in Group by clause as well. It does not allow any column in the select clause that is not part of GROUP BY clause. We can use the SQL PARTITION BY clause to resolve this issue. Let us explore it further in the next section. We can use the SQL PARTITION BY clause with the OVER clause to specify the column on which we need to perform aggregation. In the previous example, we used Group By with CustomerCity column and calculated average, minimum and maximum values. Let us rerun this scenario with the SQL PARTITION BY clause using the following query. In the output, we get aggregated values similar to a GROUP By clause. You might notice a difference in output of the SQL PARTITION BY and GROUP BY clause output. We get all records in a table using the PARTITION BY clause. It gives one row per group in result set. For example, we get a result for each group of CustomerCity in the GROUP BY clause. It gives aggregated columns with each record in the specified table. We have 15 records in the Orders table. In the query output of SQL PARTITION BY, we also get 15 rows along with Min, Max and average values. In the previous example, we get an error message if we try to add a column that is not a part of the GROUP BY clause. We can add required columns in a select statement with the SQL PARTITION BY clause. Let us add CustomerName and OrderAmout columns and execute the following query. We get CustomerName and OrderAmout column along with the output of the aggregated function. We also get all rows available in the Orders table. In the following screenshot, you can for CustomerCity Chicago, it performs aggregations (Avg, Min and Max) and gives values in respective columns. Similarly, we can use other aggregate functions such as count to find out total no of orders in a particular city with the SQL PARTITION BY clause. We can see order counts for a particular city. For example, we have two orders from Austin city therefore; it shows value 2 in CountofOrders column. We can use the SQL PARTITION BY clause with ROW_NUMBER() function to have a row number of each row. We define the following parameters to use ROW_NUMBER with the SQL PARTITION BY clause. In the following screenshot, we get see for CustomerCity Chicago, we have Row number 1 for order with highest amount 7577.90. it provides row number with descending OrderAmount. Suppose we want to get a cumulative total for the orders in a partition. Cumulative total should be of the current row and the following row in the partition. For example, in the Chicago city, we have four orders. In the following query, we the specified ROWS clause to select the current row (using CURRENT ROW) and next row (using 1 FOLLOWING). It further calculates sum on those rows using sum(Orderamount) with a partition on CustomerCity ( using OVER(PARTITION BY Customercity ORDER BY OrderAmount DESC). Similarly, we can calculate the cumulative average using the following query with the SQL PARTITION BY clause. We can use ROWS UNBOUNDED PRECEDING with the SQL PARTITION BY clause to select a row in a partition before the current row and the highest value row after current row. In the following table, we can see for row 1; it does not have any row with a high value in this partition. Therefore, Cumulative average value is the same as of row 1 OrderAmount. For Row2, It looks for current row value (7199.61) and highest value row 1(7577.9). It calculates the average for these two amounts. For Row 3, it looks for current value (6847.66) and higher amount value than this value that is 7199.61 and 7577.90. It calculates the average of these and returns. Execute the following query to get this result with our sample data.